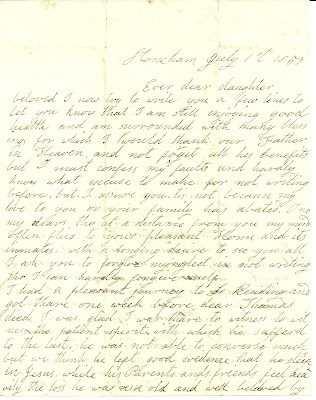 1 July 1859 letter written from Stoneham, Massachusetts by Anna Churchill to her daughter Hannah Gould. I've tried to use the clues in the letter to identify these people, but, although I've made some progress, I definitely have much work to do - a reader's nudge in the right direction wouldn't hurt! Ever dear daughter belove. I now try to write you a few lines to let you know that I am still enjoying good health and am surrounded with many blessings for which I would thank our Father in Heaven, and not forget all his benefits but I must confess my faults and hardly know what esccuse to make for not writing before, but I assure you tis not because my love to you or your family has abated. O no my dears. Tho at a distance from you my mind often flies to your pleasant Home and its inmates, with a longing desire to see you all. I ask you to forgive my neglect in not writing, though I can hardly forgive myself. I had a pleasant journey to Reading and got thare one week before dear Thomas died. I was glad I was there to witness to witness the patient spirit with which he suffered to the last, he was not able to converse much but we think he left good evidence that he sleeps in Jesus, while his Parents an friends feel heavily the loss he was [a word I can't decipher - if you figure it out, would you please email me, thanks] old and well beloved by all who knew him. I am now with your Sister O and family. They had a letter from Sary Ann last night she and her family were well. I expect to go Mr. Colby's soon and stop a while. Betsey's health is rather poor. My, she and all my children say I had aught to stay among them this summer. I should be glad to go with Mr. H. I hope that I shall go to your place next fall for I want to see you all very much. I must now close. 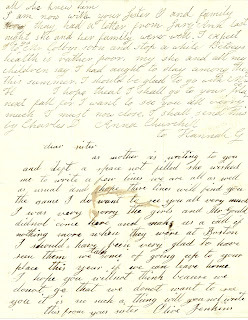 I shall send this by Charles D. Anna Churchill to Hannah G.
As mother is writing to you and left a space not filled she wished me to write a few lines. we are all as well as usual and hope these lines will find you the same. I do want to see you all very much. I was very sorry the girls and Mr. Gould did not come here and make us a call if nothing more when they were at Boston. I should have been very glad to have seen them. we talk some of going up to your place this year if we can leave home. I hope you will not think because we do not go that we do not want to see you. it is no such a thing. will you not write? this from your sister, Olive Jenkins. Sary Ann - another daughter of Anna perhaps? Betsey, whose "health is rather poor" - another daughter? Mr. Gould and the girls - are the girls daughters or granddaughters? My best find was a little bio of Olive Jenkins' son Franklin B. Jenkins who manufactured shoes in Stoneham, Massachusetts, in the History of Stoneham, Massachusetts, by William Stevens, 1891. The Jenkins family had come to Stoneham from Vermont; Olive's maiden name was given as Jackson. Hopefully this is correct. So from this I'm working on the assumption that Anna Churchill had been married to a Mr. Jackson in her earlier life, and she had at least one daughter with Mr. Jackson, if not more. I found an Anna Churchill in Hingham, Massachusetts in the 1850 and 1860 Censuses. I found an Ann Jackson living in Boston in the 1850 Census. Nothing that I feel comfortable with, however. Sister Olive was married to Joseph C. Jenkins, who was born about 1805 in Bradford, Vermont. Olive was herself was born about 1804 in either Vermont or New Hampshire - I found references to either. I tried searching for a Thomas Jackson, a Thomas Churchill and a Thomas Colby in Reading, Massachusetts, with no luck. I'd love to know what the "D" stands in in "Charles D." and who Mr. Colby was. I'm going to set this aside for a bit and come back, hopefully, with a fresh perspective. 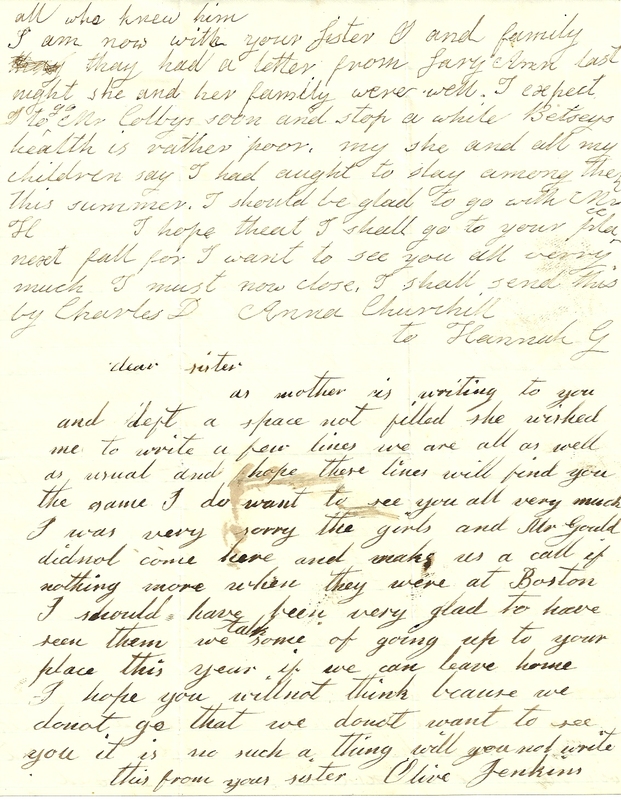 In the meantime, if you recognize the clues in this letter as pinpointing a particular family, I would surely appreciate your contacting me, either in the comments box at the bottom of this page or by email. A Thomas Colby, age 19, died of consumption on February 24, 1859 in So. Reading, MA. He was born in Madison, NH, a son of James M. & Betsy Colby. This may be the Mr. Colby referred to in the letter. Thank you for taking the time to provide this clue. Gives me another avenue to check out. 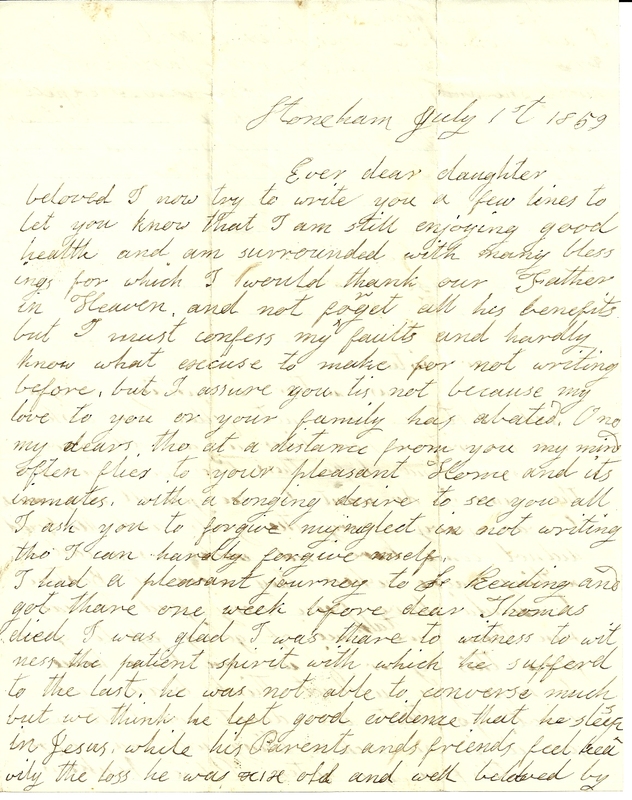 The letter was written after A. Thomas Colby's death, but Mr. Colby could refer to his father. Strange Anna didn't say "The Colbys", but if it's the right household, perhaps Betsy had also died.